This lamp design is an example of my design philosophy: capitalize on serendipity, re-mix, and upgrade. The base materials were free from Craigslist and almost free from SCRAP. The rest I ordered online and via multiple trips to my favorite store, Cole Hardware. I’m a shameless troll on the free section of Craigslist. Probably half of my apartment is furnished by “free” items that I found and maybe remixed. Even my kombucha SCOBY and kefir grains were sourced from the wonderful craigslist community. I got lucky and scored four old pool table lamp shades from a bar upgrading to gastropub status somewhere in the Mission. I gave one away, and I put the rest in my entry way so I would be reminded to do something with them. The initial concept was to hang the shades over my table, suspended by a horizontal piece made either out of wood or metal. 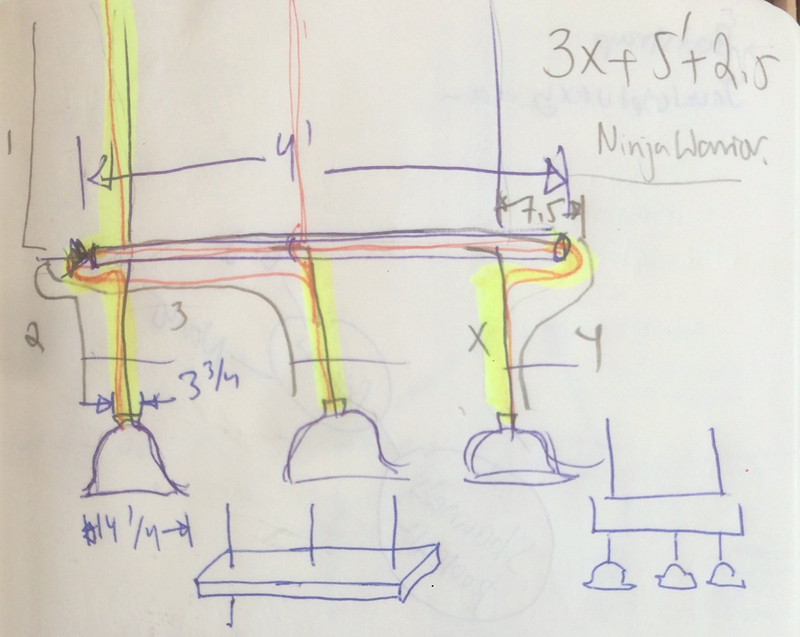 Concept sketch showing ideas for wood vs. tube. On a trip to SCRAP, I found an inspiring tube of steel has a small bend in it, giving it an organic look AND is the exact length of my dining table. Though Cole Hardware couldn’t help me drill holes, it turned out, I could tap into the community; a neighbor I know from the dog park helped me drill the holes I needed! Having the two main design elements, I sourced parts for the lamps: electrical fittings that could switch each lamp on/off individually, fabric covered electrical wire, dimmer switch, etc. Some sweat, plaster dust, and Voila! The funny thing is that I never would have designed this particular lamp without the lamp shades. When I got them, I took time to decide if they were ugly or beautiful. Creativity comes out under constraint. 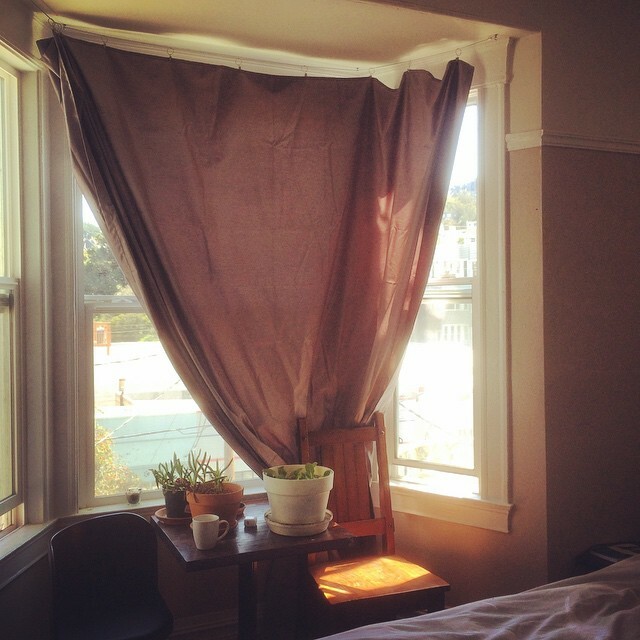 Another home DIY project: a curtain from a bedsheet that happens to fit my bay window perfectly.